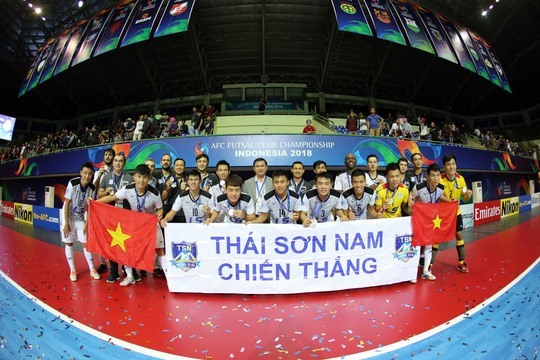 Việt Nam’s Thái Sơn Nam finished runners-up at the 2018 AFC Futsal Club Championship in Indonesia on August 12 after losing 4-2 to Mes Sungun Varzaghan of Iran in the final. Their performance is the best ever by a Vietnamese team and was painstakingly close for Thái Sơn Nam, who have finished third at the event three times. The Vietnamese side scored the opening goal in the fifth minute, but that was quickly countered by Mes Sungun Varzaghan five minutes. The Iranian club then took the lead from a corner in the 12th minute, but the game was all square before half time thanks to a wonder strike from Trần Văn Vũ. In the second half, the Iranian team continued to push, and despite Việt Nam’s best efforts, Mes Sungun Varzaghan added two more to clinch the title. Taking in place in Yogyakarta, Indonesia from August 1-12, the event drew the participation of 16 clubs competing in four groups. Although the Vietnamese team were unable to claim the crown, they beat strong opposition including Al-Dhafra (the UAE), Naft Al-wassat (Iraq), Jeonju MAG (the Republic of Korea), Nagoya Oceans (Japan), and Bank of Beirut (Lebanon). “We fought until the last second, we knew they were stronger, the favourites and the kings of Asia but we held our own against them. Our opponents had more opportunities but our goalkeeper (Hồ Văn Ý) made some good saves that kept us in the game. In the second half, we had chances to equalise, but their goalkeeper made some smart saves and we conceded a penalty late in the second half. They were superior but it was a great experience for us. I was a little surprised as luck was with us throughout the tournament,” said head coach Miguel Rodrigo on the-afc.com. “We were on the verge of getting knocked out twice and we bounced back to win those games. My players train hard at a very high level and they have come out as winners today. Hopefully a new national team has been born today," Rodrigo added. Coach Hamid Bigham Tabrizi of Mes Sungun Varzaghan said that it had been a very tough match for his team. “It was a very tough match and both teams showed that they have the right to be champions. Thái Sơn Nam are a good team and I wish them well. We did our best and played our game but at the same time we did exactly what we wanted to do. Our focus next is to win the league and of course to defend our title next year," said Tabrizi.